EIFS and stucco problems can result when improperly installed into the home. EIFS (exterior insulation finish system), often called Dry-vit, coats a home or office building with a hard, rigid covering that can be applied to a flat surface of any shape. Available in hundreds of colors and several textures, EIFS is a versatile alternative to brick veneer or vinyl siding. Its use in construction allows an architect to employ design shapes and angles that would be impractical if stone, brick or other conventional siding were used. EIFS is also less expensive to install than many conventional exteriors. And, it can provide the most thermally efficient exterior wall covering available. When properly installed, EIFS can provide an attractive protective shell for the building’s substrate, be it wood or metal. If manufacturer’s installation guidelines are not strictly followed, however, EIFS can develop cracks and leaks that allow water to get behind the textured facing and damage the substructure. Water intrusion behind the EIFS is its most common problem. Proper installation is critical around doors and windows, with the EIFS stopped about 3/8-1/2 inch from the door or window frame and an expansion joint placed there. The joint should consist of a closed cell back-up rod and flexible sealant at least 3/4-inch deep. Moisture intrusion can also take place where the EIFS intersects horizontal and vertical surfaces. According to the manufacturers, the EIFS system should be held no closer than two inches from the top surface of the roofing shingles. This prevents roof-shed moisture from contacting the bottom surface of the EIFS and rising up through it. At any point where the system terminates against a dissimilar material, such as siding or masonry, a minimum 3/4-inch gap must be left for an expansion joint and caulking. 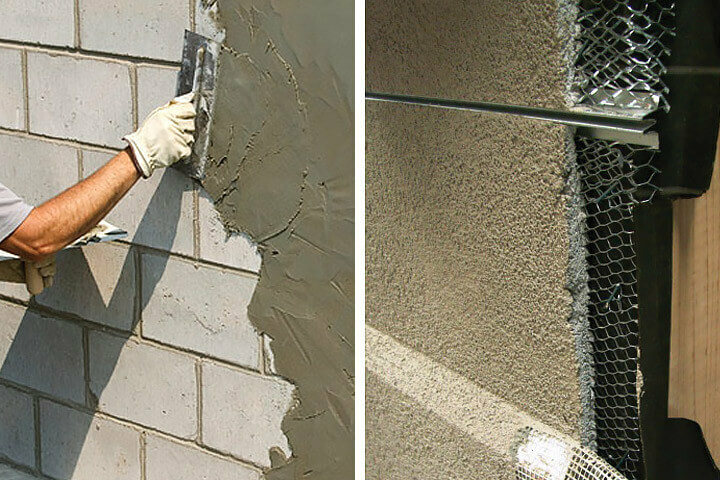 The most common type of Exterior Insulation and Finish System (EIFS), sometimes referred to as synthetic stucco, typically consists of five components: adhesive, insulation board (attached to substrate with the adhesive), a base coat into which a fiberglass mesh is imbedded, and a decorative finish coat in the desired color. This type system, called a face sealed barrier EIFS, resists water penetration at its outer surface. It is not intended to drain water from behind, however, and in this way it differs from some other types of cladding that have a weather resistant barrier behind the cladding and may have air spaces between the cladding and substrate. The base and finish coat known as the Lamina, is quite water-proof, so, once moisture intrudes behind the lamina, there is no where for it to go. Such water intrusion in wood-framed, EIFS-clad houses has become a major issue to EIFS makers, applicators, home builders, code officials, real estate agents, homeowners and home buyers. The EIFS marketplace suffers from an abundance of inadequate and misleading information, according to the NAHB (National Association of Home Builders), which conducts EIFS Remediation Seminars to demonstrate when and how EIFS and substructure repairs should be made. One of the most common myths about EIFS is that any water intrusion requires complete removal of the cladding. Good EIFS maintenance starts with regular visual inspections, preferably two per year. Even when properly installed, sealant areas require periodic inspection and maintenance. The effective life span of sealant varies greatly, depending on environmental conditions, sealant type and installation. It might be as short as three years under severe conditions. Under more typical conditions, the sealant might not need replaced until after 8-10 years. Check for missing, damaged, or deteriorated sealant between the EIFS cladding and windows, doors, and around electrical fixtures, electric meter bases, hose bibs, refrigerant lines and vents — any opening in the lamina. Only polyurethane or silicone sealant meeting the ASTM C920 Standard Specification for Elastomeric Joint Sealant should be used. Any replacement sealant should be of the same type that was originally used. Polyurethane sealant, for example, should not be used to replace silicone sealant because polyurethane does not bond well to surfaces contaminated with silicone. However, silicone can be used to replace polyurethane, so silicone is a safe choice if you do not know which kind was originally used. Inspection of the lamina might reveal cracks, holes, and discoloration, requiring the services of a qualified EIFS installer or repairer. Staining might also occur, often from soil back-splash or from sprinkler over-spray or from mildew and mold. Proper installation of EIFS requires that it be terminated at least eight inches above grade. Avoid bare earth near the structure, and remove any vegetation that might prevent the lamina from drying after a rainstorm. Stains and mildew are not usually associated with moisture intrusion and can be washed off. Consult the manufacturer of your system to get their specific cleaning recommendations. Dry-vit, for example, recommends a solution of 1 gallon of water, 1 quart of bleach and 1 cup of trisodium phosphate. Before you clean, make sure the surface is in good shape and there is no missing sealant (to avoid introducing moisture behind the cladding.) Since the finish coat of many EIF Systems is noncementitious, washing should be done as quickly as possible to avoid softening the finish coat. The finish coat can be damaged by harsh chemicals, strong cleaners, many solvents and extremely hot water. A mild liquid detergent is typically safe to use with a soft-bristled brush. Do not use wire brushes or other abrasive tools. Damage can be significant if moisture intrusion goes undetected. Inspection of an EIFS-clad building by an engineer or other qualified professional should be routine. The location of water entry is often difficult to see, and any damage to the substrate and structural members behind the exterior often cannot be detected by visual inspection. Inspections should be done annually, using both a non-invasive moisture meter and a probe-type meter that penetrates the lamina. Such meters are usually the only way to detect moisture behind the lamina. For more information concerning EIFS damage and repair, contact the NAHB Research Center’s HomeBase Hotline, at 800-898-2842, or their website at www.nahbrc.org.